Professional automotive refinishers use our ready-to-use coatings as a peelable, protective, decorative coating for wheels, emblems, stripes and designs, bumpers, accessories, truck beds or the entire vehicle. The coatings are ideal for protecting OEM finishes from small chips, scratches, scrapes, UV, chemicals, tar, bugs, and sap while providing a customized finish for all types of automobiles, trucks, enclosed trailers, ATVs, RVs, motorcycles, race vehicles, tow rigs, heavy equipment and over-the-road tractor trailers. Simply peel off when ready to change the look or return to original OEM finish. 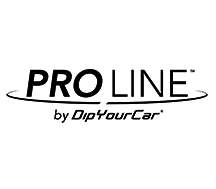 An entire product line developed in partnership with DipYourCar® for the advanced and professional installer of peelable, protective coatings for automotive refinishing at the highest level.